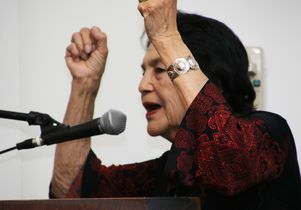 Dolores Huerta concluded her talk by leading the crowd in a “¡Sí, se puede” chant. Free higher education. Universal health care. A government that profits from the natural resources in its land and waters. Dolores Huerta wants to know how these ideas came to be considered “radical” in today’s United States. “How did we get so upside down?” the activist and co-founder of the United Farm Workers asked an enthusiastic audience. 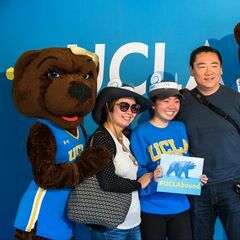 Her talk, UCLA’s sixth annual Winston C. Doby Distinguished Lecture, was delivered Feb. 28 at the Fowler Museum’s Lenart Auditorium. 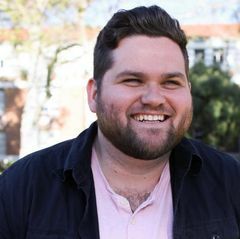 Established in 2013 by UCLA’s Academic Advancement Program, the lecture series was named in memory of the AAP’s first director, Winston Doby, who served for more than 40 years as an advocate for social justice and equal access for all students in higher education. Before Huerta’s talk, Charles Alexander, UCLA’s associate vice provost for student diversity and director of the AAP, spoke about UCLA’s commitment to social justice; and a short film highlighted the accomplishments of the Dolores Huerta Foundation, which focuses on community organizing, education reform, and voter education and registration in California’s Central Valley. 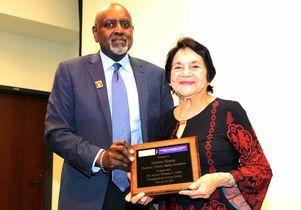 During a roughly 40-minute speech that was frequently accompanied by applause and finger snaps of agreement, Huerta adopted a professorial style as she walked the audience through the history of civil rights in the United States and the contributions of people of color, the importance of activism and the reasons people fighting for social justice should remain optimistic. Early in the talk, Huerta asked if anyone knew who Alfonso García Robles is. 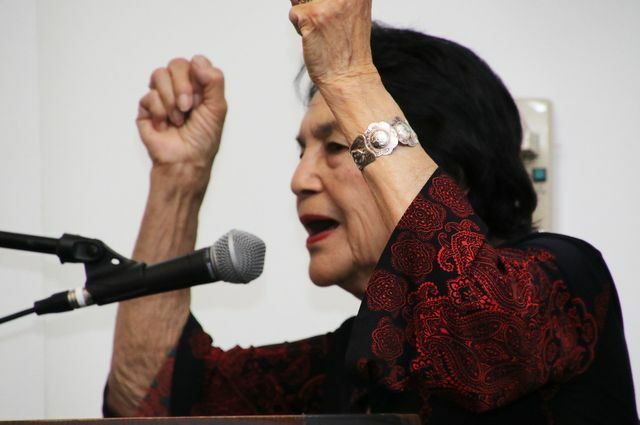 After she saw that his name wasn’t registering, Huerta informed the audience that he was the recipient of the 1982 Nobel Peace Prize — the only Mexican citizen to have won the award — and used the crowd’s lack of recognition to illustrate her contention that the accomplishments of Latin Americans, Mexican-Americans and people of color in general don’t receive the attention they deserve in U.S. classrooms. 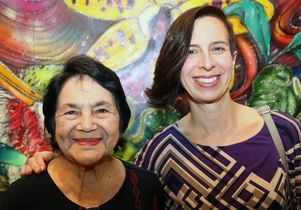 Huerta was honored in 2017 by the Universidad Nacional Autónoma de México with an award named for Robles, in recognition of her work on behalf of Latin American migrants; it’s among numerous prestigious honors she has earned, including an Eleanor Roosevelt Human Rights Award from President Bill Clinton in 1998 and the Presidential Medal of Freedom bestowed upon her by President Barack Obama in 2012. Huerta also received the UCLA Medal, the campus’s highest honor, in 2009. Throughout her talk, Huerta returned to the importance of education. She said that the biggest reason racism, bigotry, misogyny and homophobia continue is because schools don’t instill empathy, treat all people with dignity or provide an understanding of the roles of racial and ethnic minorities in U.S. history. Beginning in kindergarten, she said, students should be taught about the contributions of people of color — how indigenous people were the first slaves, and that the White House was built by African-American slaves, for example. Further, she said, ethnic studies, women’s studies and labor studies should be required in secondary schools, not just as optional college courses. Huerta also spoke about organized labor’s vital contributions to society, including the eight-hour work day, weekends off, workers compensation, disability insurance and safety standards, and she bemoaned the weakening of unions and their demonization by conservatives. Later, Huerta extolled the resurgence of political and social demonstrations that have made headlines since the beginning of 2017, and she implored audience members, particularly students, to turn their passion into action. By the end of her talk, the atmosphere had been transformed, from academic lecture to call-and-response rally. “Who’s got the power?” the 87-year-old Huerta yelled. “We’ve got the power!” the audience roared back. Labor activist Dolores Huerta delivers the sixth annual Winston C. Doby Distinguished Lecture at UCLA. Dolores Huerta, labor activist, and Marissa Lopez, UCLA professor of English and Chicana and Chicano studies.